Animals accepted - Linked to the lower town by the funicular of the coast, this studio of 25 m3 dominates Le Havre and offers a superb view over the city and the estuary of the Seine. Near a bakery, this accommodation, available all year, is ideal for a good time of relaxation & discovery lovers. PARKING is FREE and easy on the street. HOUSEHOLD LINEN IS PROVIDED (duvet covers, towels & beach towels). Pets allowed 3 € / day. 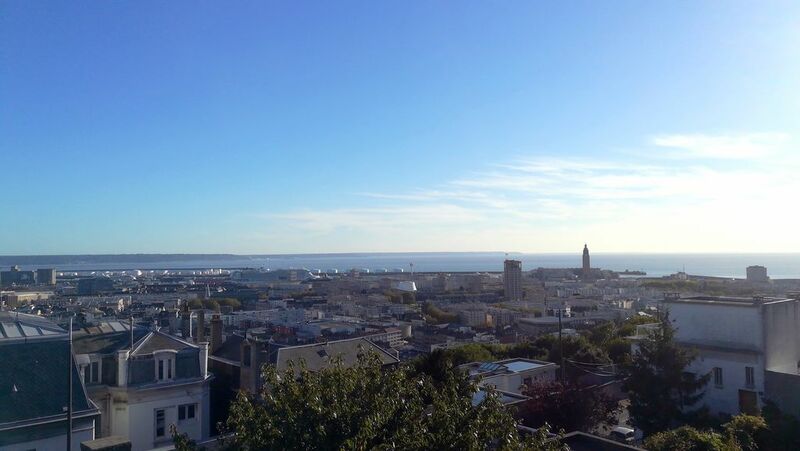 L'ESTUAIRE apartment is located on the 2nd floor of a building of 1930, in the district Felix FAURE, overlooking the UNESCO site of the city of Le Havre and the estuary of the Seine and the Normandy bridge. A living room with a living room including a sofa bed for two people equipped with a mattress and mattress DUNLOPILLO 17 cm thick, with a TV and WiFi. In the dressing room of this room you will find a set of duvet cover, duvet and pillows that are also at your disposal. A mobile fan is also provided. The kitchen area has a mini-oven, a microwave, a fridge, a kettle, a coffee maker, a juicer, a toaster and various products. such as salt, pepper, sugar, oil, vinegar, tea (Coffea) and coffee (Carte Noire). A set of 6 plates flat, hollow and dessert are also available with the cutlery and water glasses, wine, beer, champagne, coffee cups, and mugs (liquid-dish supplied). The bathroom has a shower, a sink, a washing machine (pods provided) and storage for towels (provided) and your belongings. Shower gel (Dove) and handwash liquid are also provided. A beach bag containing 2 beach towels is also available for travelers. Little notice the steps of the stairs may seem steep enough to ride for some travelers. For arrivals: 15:00 - 20:00 possibility to extend arrival times if possible. For discovery: the various exhibitions of the MuMa (painting and sculpture), the house of the shipowner, the walks on the seafront with its sunset immortalized by Claude Monet, the gardens hanging at the fort of Sainte Adresse, etc. .. Not to mention, the inevitable passage through St Joseph's Cathedral. You will enjoy the space Oscar Niemeyer and its magnificent library. Outside Le Havre, discover Etretat, Fécamp, Honfleur, loops of the Seine and its estuary. For relaxation: the beach is 5 minutes by car. For shopping: the DOCKS and Espace Coty with an essential visit to Porcelaines du Berry, rue de Paris opposite the Notre-Dame cathedral. To see, the UNESCO listed city center, the hanging gardens, the beach, the museum André MALRAUX (MuMa).